Photography is probably non-essential, so here's the last photo on the Whitehouse Flickr feed. Original caption: "President Barack Obama and Vice President Joe Biden listen as they are updated on the federal government shutdown and the approaching debt ceiling deadline, in the Oval Office, Oct. 1, 2013. 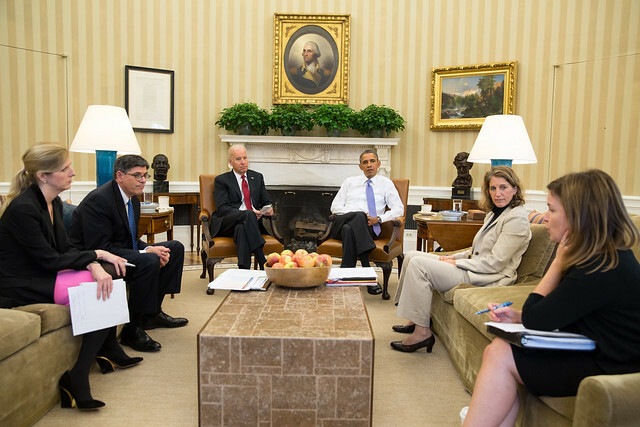 From left, Kathryn Ruemmler, Counsel to the President, Treasury Secretary Jack Lew, Sylvia Mathews Burwell, Director of OMB, and Alyssa Mastromonaco, Deputy Chief of Staff"